The Clark School is working to change that by fostering a community inclusive of individuals from all backgrounds—even before they enroll. K–12 outreach efforts help the Clark School to both recruit prospective engineering students and cultivate a diverse student population. Says Darryll Pines, dean and Farvardin Professor of Engineering at the Clark School, “It is essential that we are exposed to different perspectives and interact with people from different backgrounds in order to succeed in a global community.” A leading program for graduating underrepresented students, “the Clark School has a responsibility to increase access to the transformative experience of higher education,” he says. Partnerships with K–12 schools, program sponsors, and individual donors are necessary to ensure a diverse, inclusive, and equitable student population. When computer engineering major José Prado was a rising high school senior, he attended the four-week summer residential ESTEEM/SER-Quest program sponsored by CMSE. Prado was a student at the Puerto Rico Institute of Robotics, a high school that has partnered with CMSE since 2010. At the Clark School, Prado began developing computer programming skills through research and hands-on projects. His team’s design challenge: build a robot that would detect light and nearby objects. The robot worked, and so did the program. “The experience opened me up to computer engineering and to the Clark School,” says the Clark School senior and active CMSE volunteer. This past summer, ESTEEM/SER-Quest was offered free of cost to accepted students thanks to industry sponsorship. 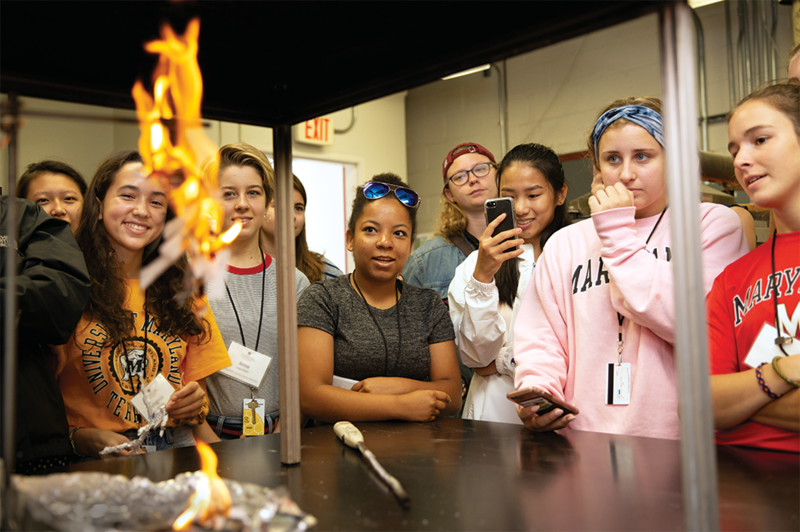 WIE’s annual DREAM Conference, which brings about 500 high schoolaged girls to campus to explore the innovations and applications of engineering and to learn about the Clark School, is also free to attendees. “Financial constraints shouldn’t inhibit student participation,” says Bowden, who encourages corporations, as well as Clark School alumni, friends, and parents, to help make such formative K–12 outreach programs more accessible to tomorrow’s engineers. It’s about “creating a better engineering community for all,” she says. Visit fearlessideas.umd.edu to learn more about Fearless Ideas: The Campaign for Maryland.